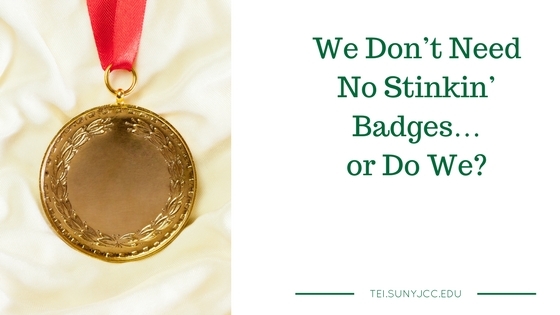 We Don’t Need No Stinkin’ Badges… or Do We? Open SUNY is exploring new strategies for meeting the needs of learners. Some of these strategies include competency-based education and stackable micro-credentials. Digital badges are excellent ways to recording completion of these strategies. This session explores the fundamentals of badging, examines reasons why you would want to employ badging, and identifies different ways badging is being used and could be used to support learning and professional development. Sorry about the call in the middle of the presentation. Sometimes it is tough to do it live in one take. Naturally, if you have questions, please contact me. Badges! What’s Up With the Stinking Badges? ← How Do I View My Instructor’s Comments in Blackboard?